The best infographics tell your data's story with style. Here's inspiration for your next data viz project. Often infographics are used for journalistic purposes, to communicate large quantities of data – which may be on a global scale – in as clear and visual a way as possible. 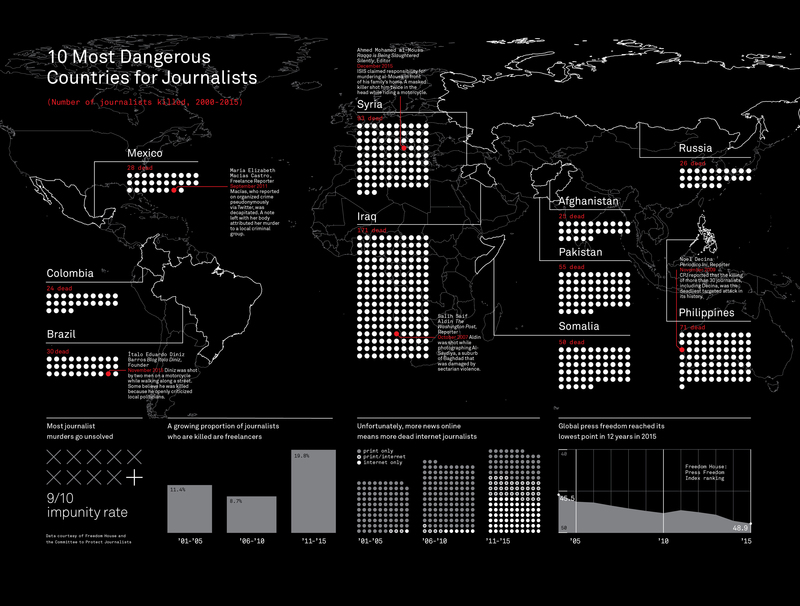 This example by Luke Shuman is a journalistic story about journalists themselves, focusing on the alarming statistics of deaths in the line of duty in different countries around the world, as well as related information such as how many go unsolved, and apparently related trends such as the volume of online news and associated press freedom. Illustrator, designer and typographer Jing Zhang has produced a whole load of adorable infographics. In this recent series, she breaks down the ingredients of your favourite cocktails, adding her own design flair with tiny figures and scenes from the drink's city of origin. Zhang also designed infographics exploring the inner workings of iPhones, cameras, clocks and TVs as well as coffees, cakes and teapots. A beautiful and original infographic, this animated wind map shows the delicate tracery of wind flowing over the US. The animation, developed by artists Fernanda Viégas and Martin Wattenberg, creates a series of beautiful patterns depending on which direction the wind is flowing. This project is also interactive, so you can zoom in to see more details in a specific area. This interactive infographic for Dribbble is lovely and creative. It's the work of Bristol-based designer Jamie Brightmore, who created his own icon illustrations and brought them to life with CSS3 and HTML5. The simple and sleek design makes this infographic stand out. Even if you're not interested in NBA basketball, you've probably heard of Kobe Bryant. In 2012 he became the youngest player in NBA history to score over 30,000 career points, and the LA Lakers released this infographic, designed by J Alexander Diaz, which gives you an insight to Kobe Bryant's scoring numbers over the course of 17 seasons. 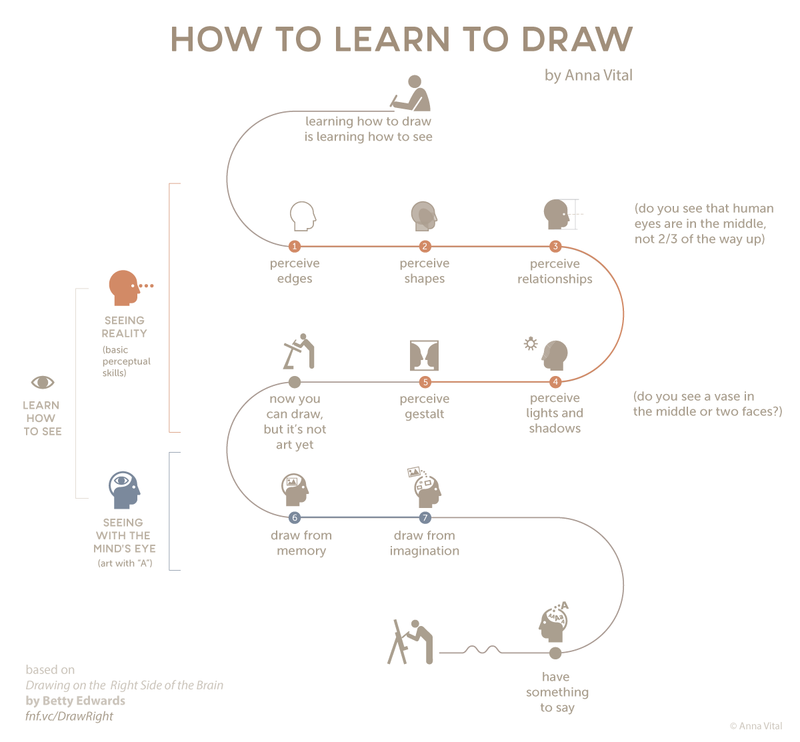 Anna Vital is an information designer and has launched her own infographic making tool, Adioma. Vital specialises in clear, pared back infographics based around simple icons, and this design offering a guide to how to learn to draw, is a great example. It removes the complexity from the process and turns it into a step-by-step guide (granted, it may take a little while to master each step). There is never a bad time to try something new and to set yourself challenges, but sometimes you need a little push. To get creatives up and running, Zippi has produced this great infographic that shows you how to start making your masterpiece in less than a week. Stuffed with tips on how to get inspiration, tackle creative blocks and promote yourself, this colourful infographic walks you through each day of the process. Want to design the perfect logo? This logo design infographic shares some advice. And while the list may seem daunting (it's easier said than done to create something timeless, new, unique and enticing), it's a great checklist you can use to see if your designs are on the right track. By now, we all know that making sure our designs are accessible to people with disabilities is a win for everyone, but this infographic showcases exactly what you can do to make sure of it. It covers everything from colour blindness to neurological disorders, as well as including some eye-opening stats to show the proportion of the population you'll be excluding if you don't pay heed to these rules. Want to be a superhero? This infographic shows you how you can acquire a back story, a secret identity and even an arch-nemesis – you'll be the next Superman (or Batman, or whoever your favourite is) in no time. This adorable infographic is the work of Canadian illustrator Zia Somjee. Whether you're concerned about which colour spandex you should opt for or how you'll go about finding your superpower, look no further than this fun and inspiring offering.